When a powerful earthquake rocked the Pacific coast of Tōhoku in March 2011, it didn’t just upend life in Japan. A massive tsunami wave swept countless coastal organisms into the open ocean, clinging to human garbage. An “extraordinary” trash-fueled migration from Japan to to North America ensued, the likes of which scientists have never seen. It’s a bizarre event, but one we might see more of in the future, as booming, trash-producing coastal cities collide with earthquakes, hurricanes, and potentially, climate change-juiced natural disasters. Just as low levels of radiation from the Fukushima nuclear disaster seeped across the Pacific, debris stirred up by the quake and subsequent tsunami has been washing up on shorelines from Hawaii to Alaska to California since 2012. For the new study, researchers from Williams College, the Smithsonian Environmental Research Center and elsewhere partnered with government officials, private citizens and coastal cleanup crews to collect and analyze 634 pieces of “Japanese marine tsunami debris” that harbored live animal communities. The authors note that the debris, collected over a five year span following the 2011 quake, represents “only a fraction” of the total junk that washed ashore—many other items weren’t reported, weren’t recognized as tsunami debris, or were in areas impossible to reach. 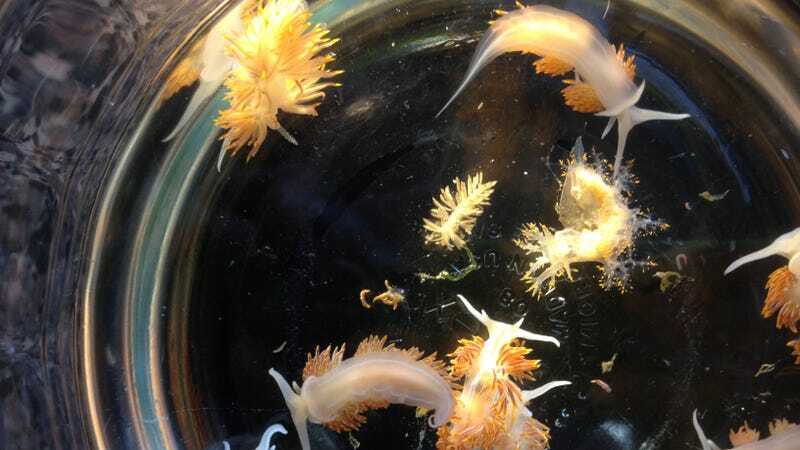 Still, this small sampling of quake-driven flotsam contained an impressive array of would-be colonists: at least 289 living invertebrate and fish species, “none of which were previously reported to have rafted transoceanically between continents,” according to the new study. These critters run the gamut from single-celled protozoans to Asian isopods, shipworms, and enormous colonies of mussels and barnacles. Amazingly, the flow of debris didn’t appear to taper off from 2012 to 2016, although the number of highly-diverse rafted communities declined over time. “It is surprising that living species from Japan continue to arrive after nearly 6 years at sea, 4 or more years longer than previous documented instances of the survival of coastal species rafting in the ocean,” the authors write, noting that the population structure of the rafted colonies suggests many animals, despite their hardship, still managed to reproduce en route. Japanese sea stars found on a fisheries dock near Newport, Oregon. Image: John Chapman. Since the time of Darwin, ecologists have been aware that animals establish themselves in new parts of the world by rafting across the high seas. But there’s a longstanding debate over how often this occurs, and how important the process is in shaping global biodiversity. As Lawrence Heaney, Curator and Head of the Division of Mammals at the Field Museum, told Earther, the new study offers one of the richest datasets yet that can help address that question. The fact that so many animals hitched a ride on garbage adds an Anthropocene-era twist to an age old story of species dispersal. As the authors note, many human-made materials don’t decompose readily, meaning they can potentially serve as lifeboats over incredibly long distances and timespans. The study’s authors seem to agree that more rafting-driven colonization could be in our future, seeing as coastal populations are booming and dumping their garbage into the ocean at staggering rates. While there’s still plenty of research to be done, it’s another plausible avenue by which humans are inadvertently scrambling the tree of life. It also reminds us that trash is far more than an eyesore—it has become an inextricable part of Earth’s ecosystems.